Wilfred Finbow was born in Wandsworth in 1920, the 4th of five children to Albert and Augusta. Albert’s occupation was shown as librarian. Wilf clearly inherited his love of books. The W of Wilfred was misread as an M, and his name recorded as Mildred! – Mildred Henry Charles. What a start in life! ! Wilf may not have known that, but he would have seen the funny side of it. His early years are a bit of a mystery, but he lived in Wandsworth, and attended the Henry Thornton School in Clapham Common. He was until his death the oldest “old boy” of the Old Thorntonians’ Association. 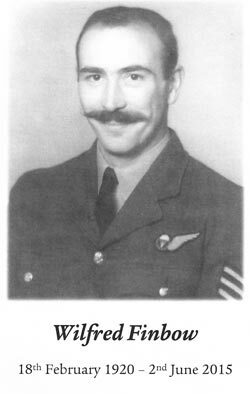 He joined the RAF in 1940 and trained at RAF Uxbridge. He progressed to Sergeant, and became a Parachute Jumping Instructor and is known to have trained French Foreign Legion Troops in preparation for the civil war that broke out in Vietnam. After the war Wilf taught PE at Marylebone Grammar School and he was highly regarded by his students who were strangely well disciplined! Wilf was much liked and he was a much loved and respected member of the Old Philogians until he died. He joined Wandsworth School in 1956 and was held in great respect by thousands of pupils until he retired in 1982. Wilf was also an Old Wandworthian and attended annual reunions of the Choir, Rugby Club and Trust until 2014. Wilf met his wife Majorie in 1953 and together they visited many European countries during their marriage and the USA and Canada to mark his retirement. Marjorie died in 2004 and Wilf never really got over her passing. They had no children but Wilf had 13 nephews and nieces and 30 something great nephews and nieces and on the day he died his great, great nephew Edward was born. Wilf was also loved by many people in the Ashtead area especially the congregation at St Giles Church. Many Wandsworthians will never forget him. This presentation is taken from the Tribute read by Richard Smith and Paul Taylor at St Giles Church, Ashstead on the 23rd June 2015.